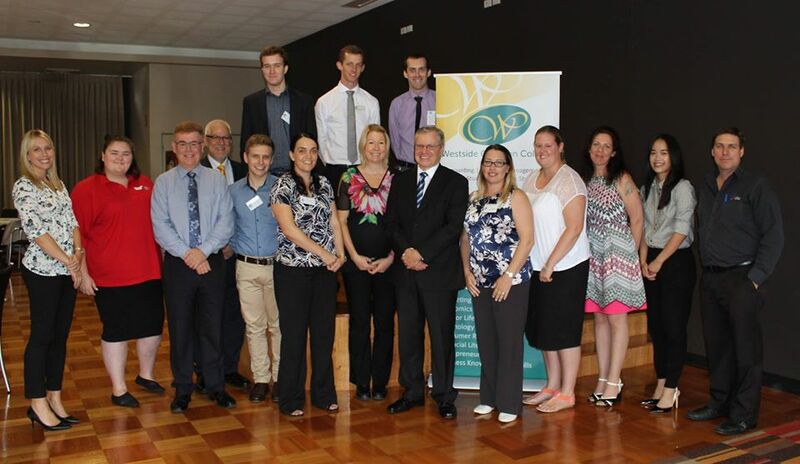 This morning 84 Business Education students welcomed 21 business leaders and university students to our annual Business Breakfast at the Goodna RSL Function Centre. The focus of the morning was to network and share stories and knowledge about the rapidly changing world of business. The morning was a resounding success. Students engaged with local business people to link what they are learning in Business Education classes with real world business. Key business leaders pose for photos at the annual Business Breakfast. We welcomed Kylie Chown as our keynote speaker. Chown is a communications and recruitment specialist and gave us many suggestions for launching our careers including considering the link between our resume, online footprint and strategy to get the job we want. Westside Christian College is passionate about preparing students for meaningful futures. Kylie’s speech was excellent preparation for students entering ‘the real world’. University students gave students great insight into life at uni including lectures, handing in assignments and coping with the workload. Planning is already underway to make the 2017 Business Breakfast even better. Westside Christian College congratulates Mrs Karen Pike, Accounting & Business Studies teacher on an excellent initiative.